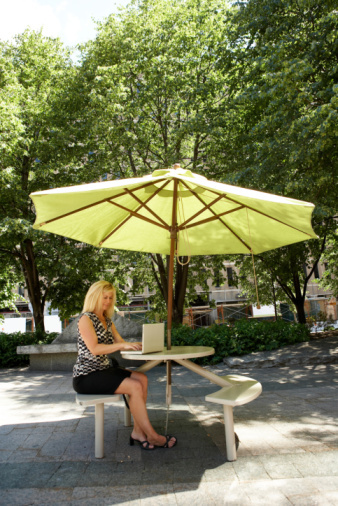 After a harsh winter, your outdoor umbrella might need a new canopy. Even if properly stored, outdoor umbrellas can get ripped and worn out. Replacing the canopy on your umbrella will help the environment by keeping the frame of the umbrella out of a landfill, plus you can customize the umbrella with fabric to match your patio set or home color. With a sewing machine and a few tools, you can replace the canopy on your outdoor umbrella. Replacing the canopy on an outdoor umbrella can add years to its use. Remove the old canopy. Unscrew the top finial and detach the sewn points of contact from the frame work of the umbrella with the seam ripper or scissors. You need the old canopy to use for a pattern to make the new canopy. Cut one of the panels of the old canopy apart to use as the pattern. Most umbrellas panels are the same size, so use one as your pattern. Fold the panel from the old umbrella in half lengthwise and lay it on pattern paper with the folded edge on the edge of the pattern paper and draw around it. Include a 3/8-inch seam allowance around the outside edges to create the pattern for the new panels. The folded edge will not need a seam allowance. Write the word "fold" along the folded edge of the paper for future reference. The old panel may need to be pressed so it will lay flat while you make the pattern piece. In the absence of pattern paper, newspaper or butcher paper will also work. Fold the new fabric in half lengthwise and apply the pattern piece with the fold line along the folded edge of the fabric. Trace the pattern onto the fabric. Cut out the pattern with scissors or a rotary cutter. Repeat to create each panel of the new canopy. Sew the panels. Hem each panel to create a clean edge around the bottom. Sew pairs of panels together and then attach the double panels to each other. Use a 3/8-inch seam allowance when sewing the panels together. Place the new canopy onto the frame. There will be a hole at the top of the canopy where the end of the umbrella frame can pass through. Turn the canopy inside out over the top of the frame so you can see the underside of the canopy hole. Sew the fabric around the top hole to the top of the frame using the upholstery needle and thread. Turn the canopy over the opened frame of the umbrella and secure each point where the old canopy was attached to the new canopy with the upholstery needle and thread. Replace the top finial. The canopy should fit snugly over the frame when the fame is completely open. How do I Measure for a Replacement Canopy Cover?